In my first childhood I knew music as a fascinating thing, as part of the beauty of life. My family had a positive and unitary conception of life which I made my own in an unaware but indelible way. On the contrary my passion for the guitar burst when I was about ten, and while passing from childhood to adolescence: the positive and unitary conception of life was starting to break up, that's why the things I liked most were so regarded as islands or shelters kept apart from the rest, and, consequently, not only incomprehensible of late, but also comdemned to a perceivable loss of fascination. It was an unexpected and lucky encounter that allowed me to find again the reasons of that positiveness I had seen and asserted when I was a child; this opened again the possibility of a conscious and progressive recovery of the reasons and aim of devoting myself to music, and also allowed me, therefore, to make the most of every helpful contribution to my musical development (among these contributions my acquaintance with Segovia played a determinant role). I am, therefore, more than ever grateful to all my guitar teachers, to start from the first ones: Leone Cecchin who managed a music shop in Forlì, Alvaro Fiorentini, a Trombone and Horn teacher at “Liceo Musicale Masini” in Forlì (he was also a double-bass player and an enthusiast manager of musical events in the same town), and finally Pietro Battelli, whose acquaintance was a decisive factor for the prosecution of my studies. Battelli introduced me into the world of the classical guitar, its repertoire, its artists. He also brought me in contact with Enrico Tagliavini (who had been one of Segovia's students in Siena); Tagliavini was my guitar teacher at “Boito” Conservatoire in Parma, where I graduated. I owe to Pietro Battelli also my encounter with Alirio Diaz whom I followed in so many guitar seminars. Later on I studied also with Oscar Ghiglia who, like Diaz, had been first one of Segovia's students, and later his assistant and substitute. Now he has got the chair at the “Accademia Chigiana” in Siena, where I studied in 1981. All these didactic experiences were very different between them, but not contradictory: each of them, someway, put me in touch with all a common musical tradition out of which I was able to grasp a particular faceting, but the feeling of the artistic value, of good taste, of discipline was essentially concordant; moreover none of those teachers deprived me of the fascination of doing music nor tried to costrain my personality: they all loved and helped me. In spite of all this, when I was about twenty-five, and, for a long time had already graduated, given concerts and worked as a teacher, I felt a deep confusion about the direction to follow in my musical path, about what teaching to hold (among the ones I had received), about what criterion to use to judge music and the musicians, how to study, to play or to plan and run my career. All these were open questions waiting for an answer. As I had not yet found out the method which might allow me to take possession of the musical tradition I had met, I was wawing between an istinctivity, which, by that time, was starting to get threadbare, the exterior imitation of my teacher's style, and an anxious pursuing the various “fashions”, (for instance when choosing the pieces forming my concert repertoire). During a conversation with Oscar Ghiglia I got an essential suggestion for my work: Ghiglia stimulated me not to try to elude the necessity of a personal comparison with every piece of music I was playing. He stated that the stilistic imitation of another musician could be rassuring but, at a given moment, it became improductive. He went on saying that if one avoids the risk of a personal relation with the music he is playing he can only copy “the shell” of another interpretation, which nevertheless, remains unaccessible in its deep mistery. Taking this direction seriously I set up to work again trying to seize the “musical idea” that each piece I was playing gave me, and letting that any interpretative decision of mine grew out of this, first of all. It was inside this work that I “rediscovered” Segovia: by listening to his recordings (which I had already know for a long time) I realized that this way of playing was really the outburst of personal and mature comparison with music (later on I knew that Segovia described interpretation as “an outburst of freedom”). This gave me the image of a person enormously further than I, but going down the same road where I was moving my first conscious steps. I think Segovia became my teacher that very moment. Of course I hoped I would have, sooner or later, the opportunity of comparing my work directly with him in order to get an unfailing judgment on my attempt. 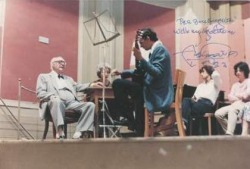 At last the occasion arose in Summer 1982, when Segovia gave a course at Geneva Conservatoire. I faced this course with an attitude quite different from the ones on other occasions. This time I neither wanted to make myself conspicuous nor I wanted to take any advantage out of the course. On this occasion the matter was more serious, it was for me a kind of truth moment. At once I realized an affinity between this position of mine and what Segovia expected from us students. From the first time, while playing for him, I felt so at ease as, perhaps, never before. Segovia in fact, first of all, called our attention to a great respect for the music we were playing and “respect” meant but a punctilious attention to the musical text, and, at the same time, an attempt of idetifying with its meaning (“interpretation” -- he said once -- “is a synthesis in continuous expansion”) in order to make playing a “convincing” fact: He, moreover, called to our mind the condition which made all this possible: the presence in each performer of that “sacred fire” which no teacher can replace; “that love, without which -- he told us -- a performer may be perfect, but nothing else...”. So, while Segovia was implacable in pointing out our oversights, our irrational interpretative choices and the pursuit of effects ends in themselves, he was likewise ready to bring out the interpretative discoveries of each of us. Segovia, so brilliantly personal in his performances, did not try to induce us to imitate him, but helped each of us to develop his own musical personality fully, by putting all his heritage of experience, knowledge, taste at our disposal. He introduced us through the living and present example of his artistic personality (with his temper and preferences) into a human and artistic learning which rose above any particular “version”. So, working on a certain kind of repertoire (through the encounter of a definite “poetics” ) what was handed down to us had a stable and permanent value, surpassing any particular age and mentality. Segovia transmitted us, what, in his own, he had learnt (“what one must do, and what one must not” he used to say). So he gave us a sure reference point (that was the very thing I was looking for !...) we could build on, free to use any further contribution of knowledge and methodological innovations (for instance the analytic work Oscar Ghiglia had developed or the fascinating guitaristic translation of the South American world that Alirio Diaz had invented). In my opinion, Segovia's teaching method was ingenious too, as it was based upon the proposal of identifying, of getting involved with the thorough criteria of his human and artistic attitude. All that happened more because an osmosis, provoked by living with him, rather than by mere communication of theoretic speeches (It could happen that people coming to the course only motivated by the curiosity of listening to speeches were disappointed and went back home telling “Segovia doesn't teach anything” ). For the above said reason the exterior form of the lesson had a careful direction where all the details had the function of setting up an atmosphere suitable for such osmosis process, to start from punctuality to order, to the seat disposition, to silence. Segovia used to listen to us very carefully, then he made his remarks; he liked better (instead of analytic dissertations) to take as a starting point a particular of the performance he had just listened to (sometimes a particular which could seem insignificant); then he intervened whith short, concise and enlightening remarks. He often helped himself with aphorisms, anecdotes, and also autobiographic examples. Maestro Segovia, who was generally good-natured, got angry (and he knew also how to be caustic), when he faced wrong ideas which required more determined means of correction. In doing so he probably ran the risk of producing some momentary resentment (It was up to the student to decide whether to be more worried of self than of something greater). Under the circumstances the “sacred fire” Segovia used to speak of, was besides in him, and also this evidence was a teaching. Then, at the end of the course he recuperated everything by saying kind-heartedly: “I noticed you were not convinced of some of the things I told you, but do not worry: when you are older you will understand I was right...”. The systematic request Segovia used to make us that we should play more slowly, was, for instance, more effective than so many words (“Even before you start playing, I would like to tell you: more slowly !...”) and this helped us not force our performance (feeling anxiety for adjusting to so-called standard parameters) not to lose that control which makes playing expressive (“It is necessary to intervene on the piece without stopping it”). So at the end of the course when we hed noticed the verificable results of this osmosis process, he said: “Now it would be the moment to start working together...”. The relationship with Segovia has meant for me an explicit, and in a certain way definitive confirmation of what I had already perceived and experienced (more or less clearly) also through all my other teachers: there is a tradition of art, of culture and civilization, that like a great flow reaches us from the past; there is a taste (I mean the capability of seizing human and artistic values) it is possible to learn: on the whole, Segovia's artistic greatness really consists in his direct joining with the western tradition of great music, not resigning himself to the marginal role for which the guitar seemed irreparably to be confined, and, by everybody's leave, not even very important guitarists had succeded in letting it out (I refer to Miguel Llobet, to Agustin Barrios, and to Francisco Tárrega, whose tradition even Segovia said he was a follower). “We must think more of music than of the guitar” he used to repeat, and really this was not a mere way of saying. Inside this great tradition I have recognized the same evidence of a last positiveness I had perceived when a child, and then, luckily found again later on. Without this last positiveness, the same creative action of writing music, and that challenge about the possibility of communicating (that is musical interpretation) would lose their meaning, and, in the long run, could not exist. The responsability I feel today of going on with my work as a performer consists in continuing proposing this tradition, this flow that even now bears new fruits (for example in so many composers I luckily collaborate with on the birth of new guitar music).